1) Sandy should not be “blamed” on climate change. 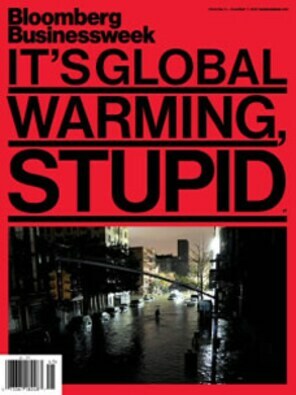 Climate change does not cause storms and did not cause Superstorm Sandy. Storms form when certain weather ingredients come together. The historic record shows violent storms, some even more severe than Sandy, have struck the Northeast repeatedly..
2) While climate change did not cause Sandy, it may have been a performance enhancer like a steroid, injecting it with somewhat more energy and power. 3) Sea level rise from manmade climate change increased the water level along the Northeast coast 6 to 8 inches and, as a result, somewhat worsened the coastal flooding from Sandy. 4) There is speculation that decreased Arctic sea ice from manmade climate change altered atmospheric steering currents, strengthening the weather system in the North Atlantic that helped to push Sandy ashore in the Northeast. This idea is controversial. 5) Climate change is likely to slowly increase the intensity of hurricanes in the future, but trends in storm frequency are less certain and the number of storms may actually decrease. Sea levels will continue to rise adding to the coastal flood risk. He goes on to examine each of these in detail, and includes lots of links to research and related articles. So if you want the full monty on Sandy and climate change I urge you to read the whole thing.